MACD and Parabolic SAR Combined Strategy is choisce of most expert binary option traders around the world. Not all strategies are profitable, but this one definitely is! A trading strategy like this is a fixed plan that is designed to achieve a profitable return by going long or short in markets. The main reasons that a properly researched trading strategy helps are its verifiability, quantifiability, consistency, and objectivity. the Moving Average Convergence/Divergence oscillator (MACD) is one of the simplest and most effective momentum indicators available. The MACD turns two trend-following indicators, moving averages, into a momentum oscillator by subtracting the longer moving average from the shorter moving average. As a result, the MACD offers the best of both worlds: trend following and momentum. The MACD fluctuates above and below the zero line as the moving averages converge, cross and diverge. 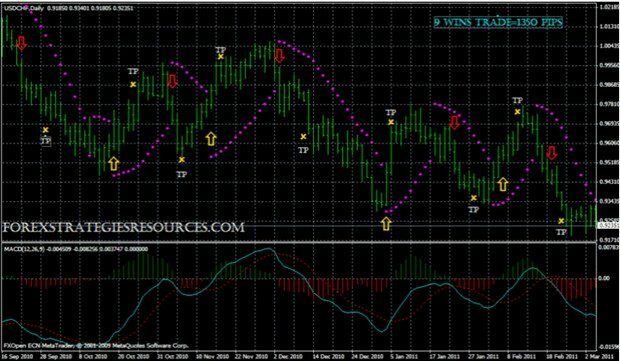 Traders can look for signal line crossovers, centerline crossovers and divergences to generate signals. Because the MACD is unbounded, it is not particularly useful for identifying overbought and oversold levels. This strategy makes use of simple indicators. These are very much available in the Mata Trader 4 platform thereby you do not need to take the task of downloading and then install fresh indicators. The first system which is MACD comes with a bevy of uses plus it provides more than just a single signal. However, in this strategy we shall make use of MACD histogram. We shall take note of its activity below and above zero. Parabolic Stop and Reverse is another indicator. Moreover, if you are in a hurry to grasp the details you can use the indicator this way: whenever the dots are just below its price; bearish signal shows when dots can be seen above price. Both of these signs make use of default settings. Trade signal appears when both MACD and Parabolic SAR agree and show similar direction. It is not ideal to use the crossover of MACD line but we have to set our eyes towards the histogram as well as its relationship with Zero. It was not stated by the author what should come first thus it may not be that vital. Nonetheless, it is obligatory that the two conditions meet at the moment of entry. The author also suggested exit points but in Binary Options trading it cannot be used thus unimportant. There is a 30 minute, 1,4, and 24 hour time frame utilized by the strategy. However, since it is a strategy for foreign exchange, the author states no clue about expiration times. Nonetheless, I think the time frames used for the entry should have an expiry which is three times longer. It is ideal to test this for yourself and judge if its good or not or if it can be used well for live accounts. One the market is chaotic and it’s noisy, it would not be too easy to notice the swings. When this happens MACD will often go below or above zero and the dots for Parabolic SAR will immediately shift from one to the other side of price. This would obviously lead to numerous out of money trades. This means that the strategy will not be so dependable should this happen. Moreover, if you trade on Calls in down trend and Puts in uptrend you will have a burnt account no matter how you follow the rules of the strategy. It is very easy to notice the signals that are produced by the strategy. What is great is that they are really concise if you are keen. It can even slightly read market context. Identifying precise market state can be very promising and can truly bring humongous benefits. When prices shoot up, make sure not to win with Puts but wait for Call entry so that things can be way better. These two indicators are freaking awesome! You can surely have a great strategy combining them. However, you need to have trader discretion which plays and huge role here. Discretion is actually a skill that you can learn from experience. You need to filter strategy signals because trading everything can lead to lesser success than taking those only in the current trend. With these details, I don’t think I will use such strategy in such trend. What I will do would be adding and indicator that will identify trends. Generally, this still needs more work.